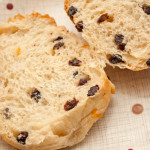 These fruited teacakes are delicious sliced in half then toasted and spread with butter. 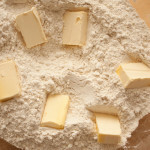 Mix together the flour, yeast, dried milk powder and salt. Then rub in the butter. 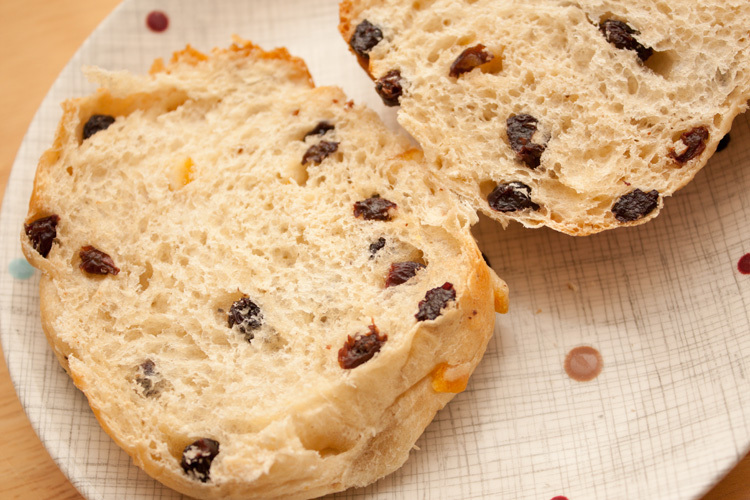 Stir in the sugar, currants, and peel. Add the water and stir it in. 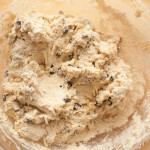 Tip the mixture out onto a flat surface. 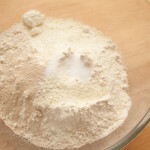 It may still be quite dry with some unmixed flour. 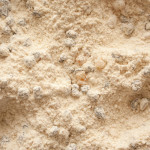 Start to knead the dough and it will soon get sticky and absorb any of the unmixed flour. Knead for about ten minutes. 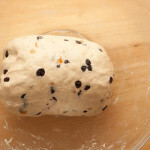 After this time the dough should be quite smooth. 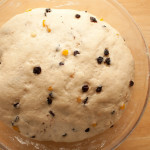 Place in a large bowl and cover the top of the bowl with plastic wrap / cling film. 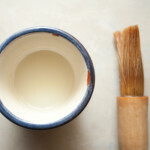 Put the bowl in a warm place around 37ºC (100ºF) for about 40 minutes to an hour until the mixture has doubled in size. (I use the top oven set to minimum temperature). 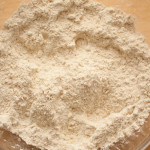 After the dough has risen turn out onto a lightly floured surface. Divide into around 12 pieces. 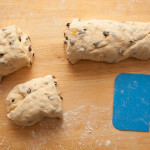 Knead lightly into rounds and place in non-stick roasting tin(s) (or any other deep tin). 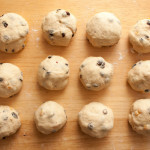 Cover the top of the tins with cling film / plastic wrap, then place in a warm place for the buns to rise. Pre-heat the main oven (not where the buns are rising!) to 220ºC (425ºF or gas mark 7 or 200ºC fan). After about an hour the buns should have risen to around twice the size. 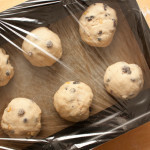 Remove the plastic wrap from the trays, then bake in the oven for about 15 minutes, until the tops are golden brown. 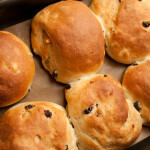 When the buns are cooked remove them and brush with the sugar-milk glaze. Return them to the oven for another 2-3 minutes to dry the glaze. 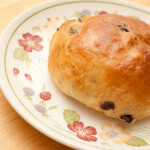 Remove the buns from the tins and cool on a wire rack. 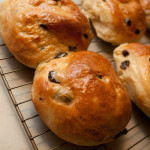 These buns are nice served cold or warmed, or warmed and sliced with butter. 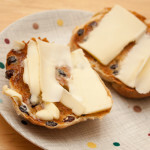 But my personal preference for teacakes is to slice in half, then toast both sides of each half and spread the cut side of each half with butter. Yum!